I live in Nara City, Japan. 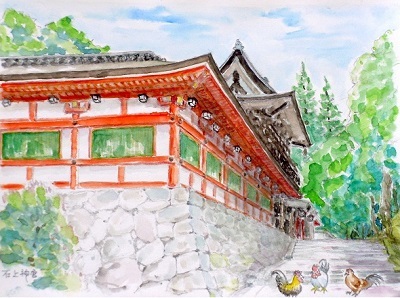 Once upon a time, Nara is called Yamato, it has been said, "Yamato mahoroba of the country" they said.This is the "mahoroba" we mean great land.Among the paintings drawn with colored pencil and watercolor, I introduce the paintings depicting scenery and traditional costumes of Japanese. This shrine is one of the oldest shrines in Japan. This shrine has been believed as a guardian deity such as healthy longevity. The precincts are surrounded by abundant evergreen trees and have a sacred atmosphere. And the chickens were released freely in the precincts. Chickens have been holy as birds telling the time early in the morning. It is a sight that this chicken is greeting worshipers. Goldfish to a public telephone box ! Chickens drawn by Itoh Jakuchu.